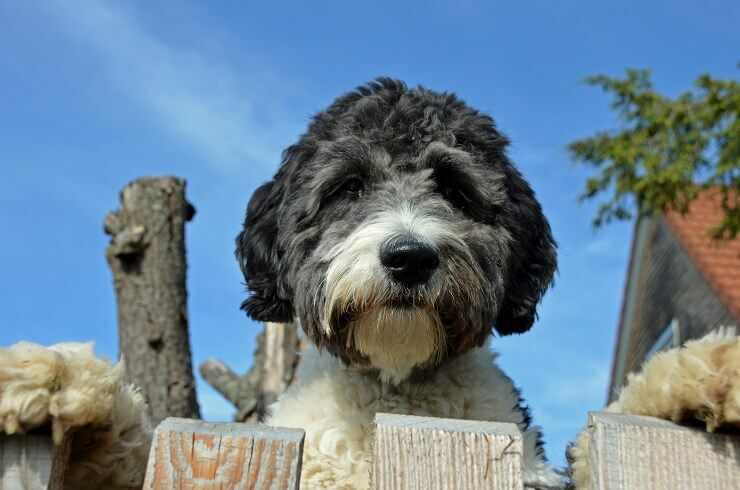 HomeBreedsAussiedoodle: Is This Teddy Bear Dog Right For Your Family? An Aussiedoodle is a cheerful and energetic cross breed between the Australian Shepherd and Poodle. They look like a teddy bear and are very intelligent. They love cuddles, playing and long walks on the beach, making them the perfect addition to any active family. This dog has lots of energy and requires a lot of commitment. It needs lots of care and attention, so read this article to find out how to keep this cross breed happy and healthy. How Much Does An Aussiedoodle Cost? An Aussiedoodle is a cross breed between the Australian Shepherd and a Poodle (either miniature or standard). They are mainly used as a companion animal, however their teddy bear looks and friendly personality has also made them popular therapy dogs. 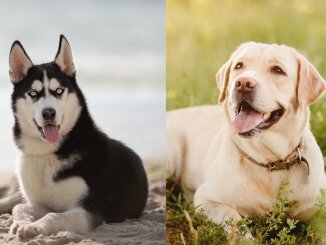 The parent breeds both have a long ancestry. The Poodle can be traced back to 17th century Germany where they were used to retrieve water fowl. The Australian Shepherd isn’t actually from Australia, they originated in the western US on ranges in the 19th century, used for herding livestock. Although the American Kennel Club doesn’t recognize them because they are a hybrid, both the Australian Shepherd and the Poodle are recognized the AKC. The Aussie Shepherd in the herding group and the Poodle in the non-sporting group. As they are crossbred, they can have unpredictable looks. It all comes down to which genes are expressed for each pup – each puppy in the same litter can look completely different. The Aussiedoodle can look more like an Australian Shepherd, or a Poodle, or could look like a mixture of both! There is no telling until the pup has fully grown. What is for certain though is their teddy bear appearance. They will have shaggy and fluffy fur with floppy ears and kind eyes. It’s important to note that they are thought to be hypoallergenic (thanks to the Poodle genes) but this can vary with every puppy. There are two types of Aussiedoodle, depending on what type of Poodle their parent is. Larger ones will be broad and sturdy, while one with a miniature Poodle parent will be smaller and lightly built. A mini one has a mini Poodle parent. These little hybrids can grow up to 35lbs and 12-18 inches tall. A standard size has a standard Poodle parent. 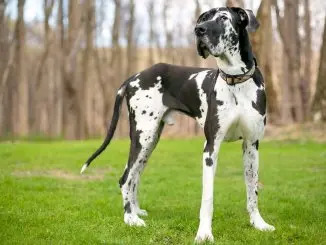 These dogs can grow up to 70lbs and can be up to 22 inches tall. Just like their size, their coat and color is unpredictable too! The Australian Shepherd can be black, blue merle, red or red merle. They can also have tan points and white markings spotted around their body. Poodles have even more variations than the Aussie Shepherd. Some include apricot, black, blue, brown, cream, white and red. So your Aussiedoodle can be anything above, depending on their parents’ genes! As far as their coat, depending on what genes are expressed they can have two types of coats. They could have a soft and curly coat thanks to the poodle. They could have a straight or curly coat like the Australian Shepherd. The Australian Shepherd has a double coat, so there’s a chance your pooch could have one as well. You should expect this breed to be very friendly, intelligent, energetic and loving. They are socially-orientated and want lots of attention. The Aussiedoodle will be no stranger to hugs and cuddles, they will want to be a lap dog no matter how big they get. Thanks to their strong social skills, they have no problems making friends. Even though they don’t mind strangers when out on walks, they will mind it when a stranger is in their home. The Australian Shepherd was used to guard the ranges, so they have a keen watch dog instinct. Unfortunately, because they are social dogs, they want to be around people at all times and don’t do well on their own. They are prone to separation anxiety, so its best to make sure you have the time to spend with this dog. They can be very playful – they will love a game of chase. Thanks to their herding heritage they have an instinct to start herding and nipping at children so keep a watchful eye on this (more on this later). In fact, they can become hyperactive and destructive if not exercised regularly. This cross breed is very friendly overall, they are okay around dogs, as long as they have been socialized correctly. 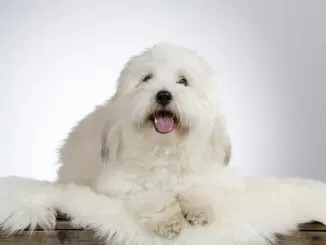 Is The Aussiedoodle A Good Family Dog? Aussiedoodles are great with kids, they are gentle and patient. These playful cross breeds will love play time and children have the same energy levels to match them – perfect play mates! As said before they don’t have any aggressive tendencies, so there should be no worries there. However you should always keep an eye on your dog and children playing together, and make sure to teach your kids understand basic dog body language. The Aussiedoodle is extremely smart, thanks to both parent breeds being very intelligent. Also because of the Australian Shepherds eagerness to please, they should be fairly easy to train! They will respond best to positive reinforcement. Punishment should be avoided as much as possible as this leads to problematic behavior. These dogs love treats and praise, but they will tend to prefer one over the other. As mentioned earlier, one problematic behavior is herding and nipping children – this can easily be trained out. To stop them herding children around the house you should distract them by using a ball or a toy. Socialization is vital with every breed! Expose them to a wide range of people, children and animals as a pup. The same goes for household appliances like washing machines that make loud noises. Start training and socialization as soon as you bring your puppy home! It’s important to know that when intelligent dogs don’t get mental stimulation, they can become frustrated and bored, causing them to be destructive. Give them a puzzle feeder and play hide and seek with their treats. Let them play with other dogs, and give them social interaction as much as possible to improve their cognitive skills. 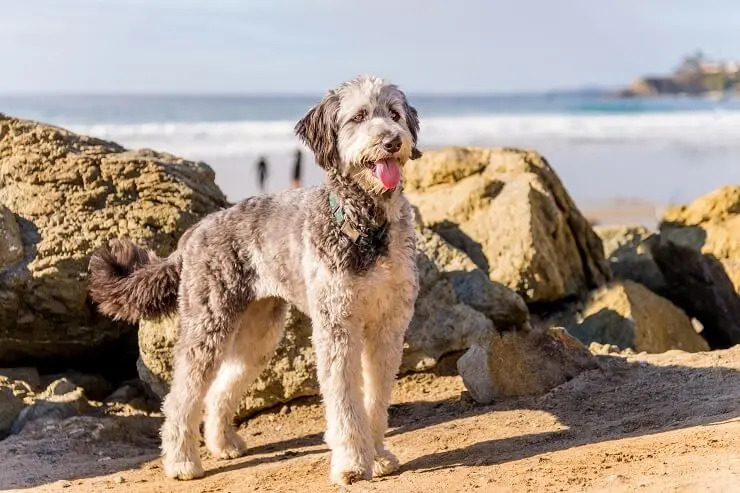 The Aussiedoodle will be an adorable addition to your family, but first you should know how to care for one of these dogs. They are adaptable, so they do well in apartments and houses. However, they have a lot of energy, so be sure you are ready to take on a dog that needs a lot of activity. These bundles of energy need a lot of care and attention – perfect for a loving family! Thanks to both of the parent breeds’ background, this cross breed is very energetic. They need around 90 minutes of exercise each day, otherwise you will have to deal with a hyperactive dog that will try to chew everything in sight! Take them out for a jog, to the beach or for a hike. They love all kinds of activity and are a highly athletic breed. When taking them for walks, you should keep them on a leash until you are confident in their recall ability. They are fairly dog friendly, so you can take them to dog parks too. Their grooming requirements will vary depending on the coat type they inherit. Aussiedoodles can inherit a long, wavy double coat from the Aussie Shepherd. If they do, they will shed their undercoat every spring and fall. During their blow out they will need to be brushed at least every other day. If their coat is more curly, like the Poodles, they will need to have their fur trimmed around every 10 weeks. This helps to keep their coat healthy. They will need to have their nails clipped regularly to keep them at comfortable lengths. Brush their teeth once a week and clean their ears out with a damp cloth regularly to avoid any build up. The Aussiedoodle needs a balanced diet of protein, fats, vitamins and minerals. They will need around 2 meals a day, divided into equal portions. One in the morning and one in the evening. How much you feed your pooch is dependent on how much they weigh. You should be feeding a mini version around 1-1.5 cups of kibble and the standard around 2.5-3.5 cups of kibble a day. Some people believe that a raw food diet is the most beneficial to dogs, whereas others stick to the commercial dog kibble diet. Either are okay, as long as they are high quality ingredients. Find a feed with recognizable, whole-food ingredients. Avoid filler ingredients like corn-syrup, as high concentrations of carbohydrates can be harmful to your dog. You can also treat them with fruit and vegetables in moderation. Aussiedoodles are cross breeds, meaning they have more genetic variation than pure breeds. This means they should have less chance of inheriting genetic disorders. Hip dysplasia is common with this breed, keep them at a healthy weight and feed a nutritious diet to prevent it. Miniature ones are more prone to luxating patella, this is where the kneecap dislodges. They are prone to epilepsy. Aussiedoodles are prone to suffering to a range of eye disorders like cataracts. Obesity is common in companion dogs, and this can really affect a dog’s quality of life. If they are not fed correctly and given the right amount of exercise, obesity will become a reality. How Long Does an Aussiedoodle Live? The average healthy Aussiedoodle will live up to 10-12 years. 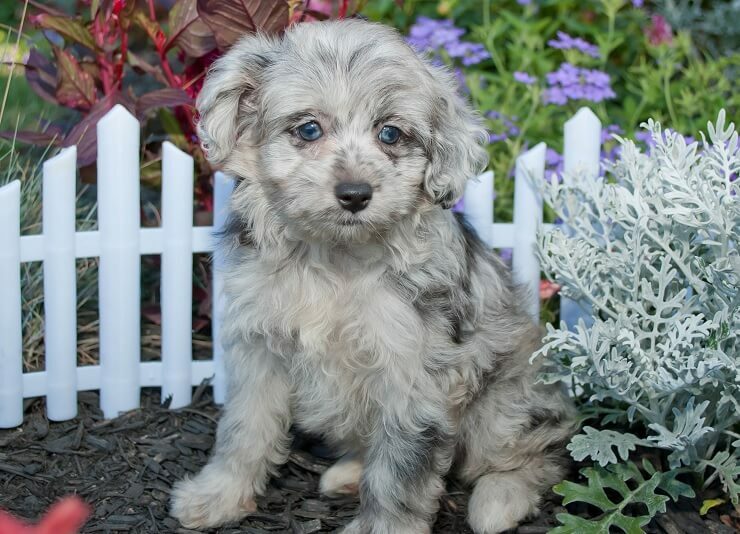 To buy one adorable Aussiedoodle puppy, you need to find a reputable breeder to ensure you get a healthy pup. The breeding market may look daunting at first, but once you know the signs of a puppy mill it will be easier to find a trustworthy breeder. Trustworthy breeders will be open to you visiting and meeting them, and most importantly, meeting mom. Seeing mom will allow you to see her health and how she interacts with her pups. If a breeder doesn’t let the mom care for her puppies, they can mature with problematic behaviors. The breeder should also provide you with medical certificates to show you mom and dad are healthy. As the Aussie Shepherd and the Poodle are both recognized by the AKC, a good breeder should have the parents registered with the AKC. Make sure you ask the breeder questions like how many litters has mom had, what food are you giving the puppies and what level of socialization have the puppies had? Stay away from pushy breeders and ones that claim their pups are 100% hypoallergenic – there is no guarantee this is true with hybrid breeds. You should expect to pay between $1000-$2000 for an Aussiedoodle puppy. 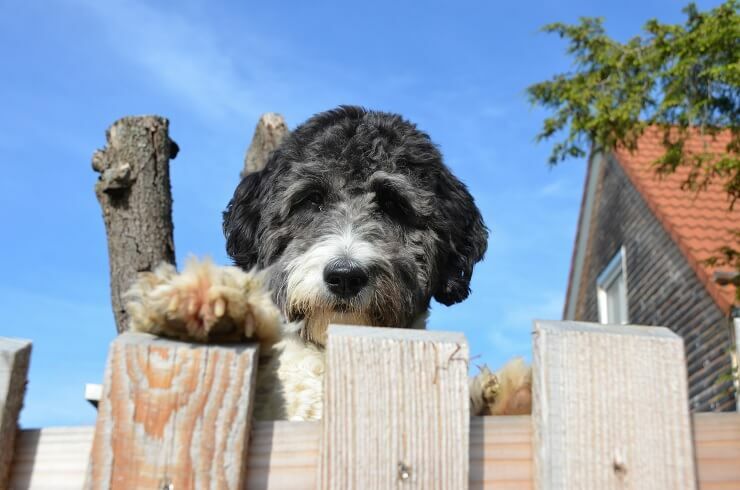 Overall, the Aussiedoodle is a friendly, cheerful and energetic cross breed perfect for an active family. This isn’t a dog for someone with a laidback lifestyle. They need at least 90 minutes of activity each day, otherwise you will find a hyperactive teddy bear running around the house. As they are very smart, they will need a lot of mental stimulation. So give them plenty of toys, puzzle feeders and play games with them. Being a cross breed their appearance can be a little bit unpredictable, but there is no doubt that these dogs are very friendly and loveable!